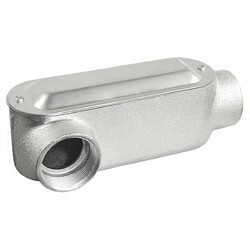 Conduit Body Tee Type finds its applications in conduit fittings / electrical conduit raceway to connect the conduit and protect and provide access to conductors for future maintenance. T type conduit outlet body can be used with EMT rigid or MCI conduit. Looking majorly for foreign queries. - Trade size : 1/2"
Application:To provide access to conductors for pulling, splicing and maintenance. We offer our client an excellent quality range of Conduit Bodies, which are manufactured from high grade quality raw materials. These Conduit Bodies can be customized as per our precious customers specifications. These Conduit Bodies are widely known for its durability and quality. Our Conduit Bodies can be availed at industrial leading price. - Size: 1/2", 3/4", 1", 1-1/4", 1-1/2", 2"
Conduit bodies, boxes, covers, Lightings for commercial applications.